Bosch added three new digital laser measures to their line up that are sure to impress. The GLR225, coming out this month, looks to be the next step up from the previous DLR130K & DLR165K. It features a 230 foot range and an accuracy of 1/16”. It also adds the Pythagorean theorem function that was available in the DLR165K, but was missing from the DLR130K. In total, the GLR225 offers 7 different measurement modes – length, area, volume, minimum/maximum, continuous, indirect length and multi-surface area measurements. 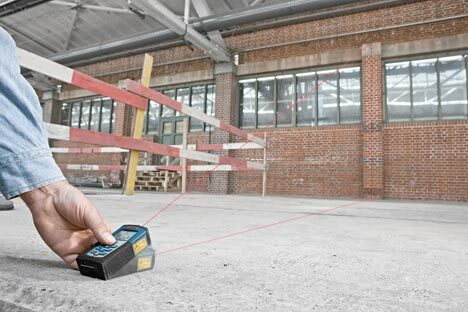 The new min/max mode allows users to sweep the laser across a surface, and the laser will display the minimum and the maximum distance form your location. The next two DLRs, model GLR500 and GLR825 offer a measuring range of 500 feet and 825 feet respectively, and have an impressive accuracy of 1 millimeter (about 1/25”). Because measuring at such great distances can be difficult, Bosch has added a 1.6x magnification viewfinder to both models. These lasers have even more measuring modes then the GLR225, 11 in total – length, area, volume, minimum/maximum, continuous, indirect length, double indirect, combined indirect, stake out, trapezoid, multi-surface area and timed measurement. Other features such as built-in memory, and an illuminated display have also been added. Models GLR500 and GLR825 should be available this July.